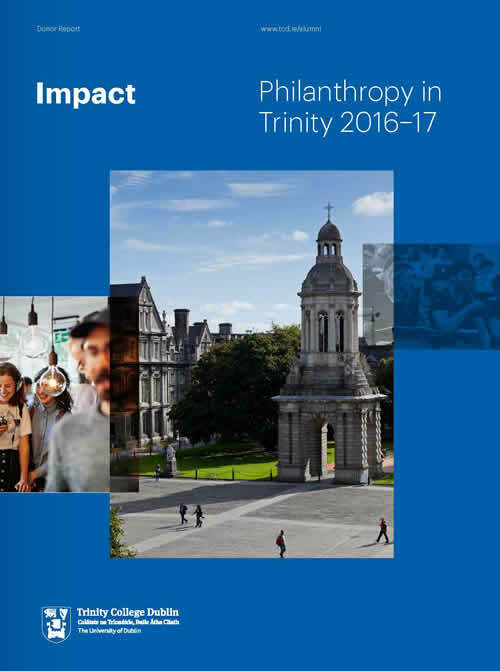 IMPACT, our Donor Report for the year ended 30 September 2017, highlights the depth, variety and importance of University projects that are made possible by our tremendous supporters - alumni, friends of Trinity, foundations, trusts and corporations. Trinity College Dublin is constantly developing and building on its 426 year history. Students and staff recognise that Trinity would be a poorer place were it not for the enthusiastic and constant support of donors such as you. Read our Donor Report online, view PDF or contact the office to request a hard copy. For more Trinity Development and Alumni publications visit our publications page.